Discover the wonder and mystery of the underwater world and more through our camps, overnights and behind-the-scenes tours! To register, make reservations and check availability for any of our Family Programs, please contact us at (303) 561-4444 or AQDenverEdu@ldry.com. At Downtown Aquarium you can snorkel or scuba dive with the fish! Swim with the Fish & Dive with the Sharks are two of our most popular and exciting programs! To reserve your dive, please visit www.a1scuba.com or call 303-789-2450. Download detailed program information. Experience what it's like to swim with Groupers, Moray Eels, Guitar Fish, Rays, and hundreds more of their closest friends in our "Under the Sea" exhibit. Private and group snorkel trips available. Program includes T-Shirt and your choice of 1 exhibit admission OR free parking. Guests who are visibly ill or under the influence of drugs or alcohol will not be permitted to participate in their snorkel adventure. Swim with the Fish! Watch the Video Now! Dive into adventure in our Sunken Shipwreck exhibit for an up-close encounter with 10ft Sand tiger Sharks, Sandbar Sharks, Zebra Sharks, Guitarfish, three 12ft Sawfish, and hundreds of other fish from around the world. Divers must be dive certified and must present valid SCUBA certification card at check-in on the day of program. Guests who are visibly ill or under the influence of drugs or alcohol are not permitted to participate in their scuba adventure. Experience what its like to scuba dive with Groupers, Moray Eels, Guitar Fish, Rays, and hundreds more of their closest friends in our "Under the Sea" exhibit. Uncertified scuba experiences are available for Dive With the Fish, visit www.a1scuba.com or call 303-789-2450 for more information. All Dive With the Fish programs include T-Shirt and your choice of 1 exhibit admission OR free parking. Take the plunge in our shark cage. Encounter Sand Tiger sharks, Sandbar sharks, Zebra sharks, Blacktip sharks and Bamboo sharks up close and hundreds of other fish in our Shipwreck exhibit. Guests who are visibly ill or under the influence of drugs or alcohol are not permitted to participate in their diving adventure. Cost: $65 per person (plus tax). Groups with 5 or more children will receive 1 free adult with every 5 paid children. If you have a group of 35 or more children/chaperones and want to schedule a private date, please call to reserve. Splash into summer with hands-on interactive experiences. Take part in a wild escapade through rainforests, reefs, rivers and more in our 5-day long camps! Pre-registration is required. Call 303-561-4444 for dates and information. Have a one-on-one encounter with an animal ambassador; depending on the animal you may be able to feed, touch, train, and/or get your picture taken with the animal. 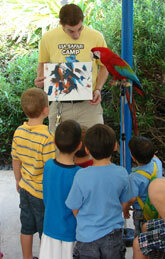 You can meet our porcupine, sloth, serval, binturong, snakes, tortoises, or parrots. Schedule: Appointment only. Please reserve your space here. Join us every Wednesday at 9:30am at the Nautilus Ballroom entrance. Sing, dance and listen to a story as you meet an animal up-close and personal. For babies, toddlers and their adults. Cost is free for Aquarium members and $5 per family for non-members. (Does not include admission into the exhibits).